The wave of attacks that has struck American embassies in the Middle East will not force Washington to rethink its policy in the region, according to the president of the Middle East Institute, Yevgeny Satanovsky. The attacks were triggered by an American film, “Innocence of Muslims,” that depicts the Prophet Muhammad in an unflattering light. Reports on the American film Innocence of Muslims, which lampoons the Prophet Mohammed, appeared in the media on the anniversary of the 9/11 terrorist attacks. On that same day, the American consulate in Benghazi, Libya was shelled and then set on fire. As a result, U.S. Ambassador to Libya Christopher Stevens, his assistant and two marines guarding the consulate died. The murder of the U.S. Ambassador in Benghazi was the first since the U.S. Ambassador to Afghanistan, Adolph Dubs, was kidnapped and killed in 1979. Protest actions were also held in Yemen, Egypt and Iran. Protesters stormed the U.S. Embassy in Sana, and, in Cairo, police had to use tear gas outside the American mission. Nigerian authorities reported that they have tightened security around the U.S. embassy fearing an attack by the Islamist group Boko Haram. Nevertheless, the wave of anti-Americanism in the Middle East is hardly likely to change the mind of American politicians, the Middle East Institute President Yevgeny Satanovsky argues. Vzglyad: Will the State Department conduct an analysis of the events? Are Hillary Clinton and her colleagues ready to admit that it was imprudent to support the rebels a year ago? Yevgeny Satanovsky: No, that is out of the question. To start analyzing mistakes, one has to be self-critical and be able to look at oneself from outside. This does not apply to many people in modern American politics. 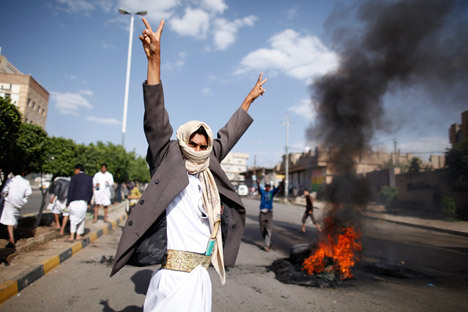 Vzglyad: Why is unrest spilling over into more and more Arab states? Where else might an outburst of anti-American sentiment be expected? Y.S. : An outburst of anti-American sentiment can be expected wherever governments are not in control. Anti-Americanism runs high and, traditionally, this is the way local populations express their feelings. The countries in question do not have a strong centralized party that can control the situation. Current conditions are the same as when the Persians killed [Russian Ambassador to Persia Aleksandr] Griboyedov in the early 19th century. Vzglyad:How will these events impact the electoral race in the United States? What will they do to Barack Obama’s rating? Y.S. : Obama will say and do all the right things. He will use the right body language, the right gestures and wear the appropriate suit and tie when he stands in front of the microphone and says the right words in the right tone of voice. Obama is a populist who plays to the grandstand. Obama’s rating is practically level with that of [Republican candidate Mitt] Romney. Yet, he still has an ample chance to save face, which he is likely to do. The interview is abridged and first published in Russian in the Vzglyad newspaper.